We've had visitors the past four weekends - each of our children and their spouses, plus one set of friends. And oh, it's been wonderful! Gut-busting laughter, meal times askew, cozy moments indoors and crankiness-clearing walks outdoors. So who's coming next weekend? The Super Moon, more correctly called the Lunar Perigree, seen on Saturday night, caused the highest tides of the month. At low tide on Sunday afternoon we walked along the beach. A great screech of gulls, seen as white dots in the photo, feasted on the roe left behind by an army of herring who left their roe clustered onto the seaweed that washed up onto shore. Gulls were not alone in enjoying the herring. Every big rock had an eagle perched on top. On the large rock in the photo, an impassive convocation of eagles surveyed the scene. Thank you to Mary for hosting Mosaic Monday. Great shots! Terrific beach scenes! The seaweed picture is really interesting! Sounds like you had some very busy, but fun weekends! Enjoy! Those beach scenes look chilly. Hadn't thought about the moon's effect on the tide. Your comment about weekends at your house have me wondering about next weekend and if it'll be more company, a quiet weekend for two or a visit to someone else's home. One thing is certain, you always stay busy. 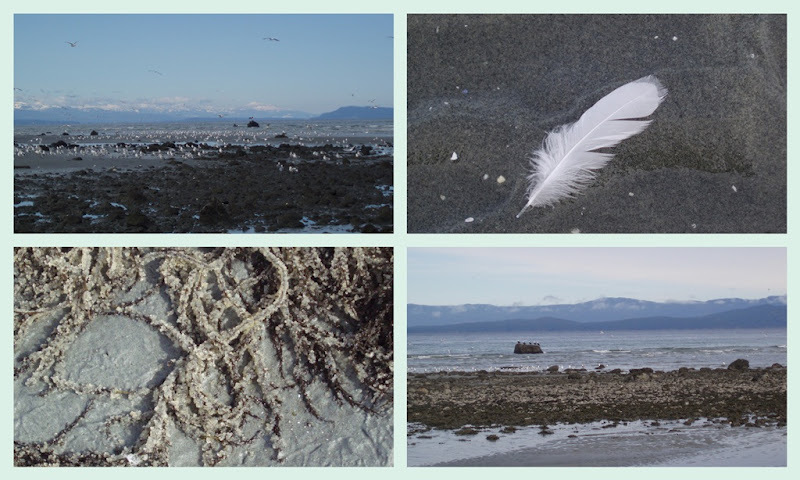 I love beach shots at any time of year and these are so atmospheric with the snow capped mountains in the background. I must get to the beach today to see what I can see and maybe find a piece of wood painted blue for an art piece. Sounds like you've been having a wonderful time with your guests! Love the seaside mosaic! You live in a wonderful place, no wonder your weekends are full of visitors! Your pictures are wonderful, and I learned some new words too. These lovely photos make me want to smell the ocean!!! Have another beautiful week!!! Beautiful photos! and so glad you've had such warm family times together lately. I'm so glad to read that you've had a good clear out of cobwebs - the wind and surf will do it every time. I love the words you've highlighted - have always been amused by a Murder of crows. A lovely peaceful feel to your collage. I always love to visit you because love looking at your photos...have to make myself back to the West coast...love it! Lorrie - it looks like the sun is shining again and that you had a wonderful weekend. Glad that you enjoyed it so much and thanks for taking us along to the beach! I can see the seashore has been busy, as busy as the goings on with the comings and goings of your family. What fun! I didn't realize herring left roe on seaweed. That's very interesting. It makes fast food for gulls! Hi Lorrie...love the photo of the seagull feather on the sand. You have been a busy lady, sounds like you have a "BnB" as well! How is your kitchen coming along? Our granite countertops arrived today....it was nasty weather for travelling, so I was certain they would cancel,,,but when I got home from work, there they were shining in all their countertop glory! Will get back to putting some pics on my blog again soon. Take care! What a great time you have had with your visitors. Got a great photo of the Lunar Perigree which I have posted of course. Warm sunny spring weather this week with low 60's. Means much gardening though.